My hubby gets breakfast in bed every Sunday and I am always trying to find new things to make him. Well for Father’s Day he got one of his favourite foods with a little twist: a Breakfast Pizza. Set the oven to the temperature as recommended on the pre-bought pizza bases. If you make your own, the recipe that you use should specify this. Add the oil to a pan and when it’s warmed up, fry the bacon until it is done and then remove it from the stove. Slice the mushrooms, salami and avocado into the sizes that you would like but try not to make them to big as or the eater will struggle when eating it. Pack out the pizza bases and add all your toppings, salt and herbs but not the egg and the cheese. Once all your toppings are on and the oven is at the right temperate, crack the egg over the middle of the pizza. 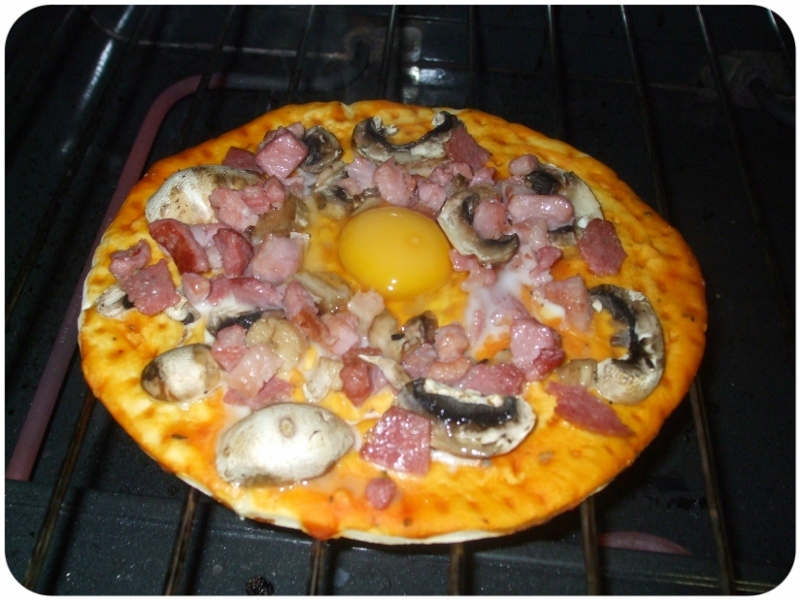 Put the pizza into the oven and let it cook until the egg looks done.